My thoughts on whatever I am thinking about at the moment, be it work, chess, cricket, or life in general. As black against a higher rated opponent, I did just fine throughout the entire game until my very last move. Though one is never happy with a loss, I felt I was in good form and wasn’t too discouraged by the game. Again, as black. Playing someone who has given me trouble in the past (I have now played him thrice, each time with black), I felt that his endgame play was the weakest and where he was very indecisive. So my plan was to play …c5 as early as possible – a lesson learnt from my previous game (the second game on that post) with him – and to try and get into an early endgame with him. Once there, I was able to outplay and outmaneuver him to win the game. In fact the position was quite drawish (he offered me a draw after his 32nd move) and there would’ve been nothing wrong in accepting the offer. On the other hand, I felt I couldn’t lose the position and decided to play on to see if I could break through. Eventually, he made a couple of inaccuracies and allowed me to win! There was only one move in the game where I missed a pretty tactic to gain a small advantage in the endgame. 1. d4 d5 2. c4 c6 3. Nc3 Nf6 4. e3 e6 5. Nf3 Be7 6. Bd3 dxc4 7. Bxc4 b5 8. Be2 O-O 9. O-O Bb7 10. Ne5 a6 11. Bf3 Qc7 12. Ne4 Nxe4 13. Bxe4 c5 14. Bxb7 Qxb7 15. Qf3 Qxf3 16. Nxf3 Nc6 17. dxc5 Bxc5 18. Bd2 Rac8 19. a3 Rfd8 20. Rac1 Bb6 21. Rc2 Ne7? Very rare for me to have a game which is totally one-sided. Playing the white side of a Pirc with opposite side castling, I was able to attack on the kingside without any defensive worries. My opponent made no efforts to complicate play by initiating counter-play on the queenside or in the center. I could therefore just focus on my attack and despite one move which nearly threw away all my advantage, I was able to wrap up the game in short order. 1. e4 g6 2. d4 Bg7 3. Nc3 d6 4. Be3 Nf6 5. f3 O-O 6. Qd2 e5 7. O-O-O exd4 8. Bxd4 Re8 9. g4 a6 10. g5 Nh5 11. Bxg7 Nxg7 12. Nge2 Nc6 13. Ng3 Be6 14. h4 Ne7 15. h5 Rf8 16. Qh2 f5 17. gxf6 Rxf6 18. hxg6 hxg6 19. e5 Rf8 20. Nce4 Nef5 21. f4 Kf7 22. Qh7? At the time it seemed like a strong move. But after 22…Rh8, most of my advantage disappears. 22. Nxf5! was much stronger and the way to maintain the winning attack. But my opponent failed to take advantage of my error and it was smooth sailing from there. As fate would have it, I didn’t get to play the expected game with white. I had to fill in on the last board for another team in the club, so my scheduled game in the internal competition got postponed. And…again…I was black. It certainly was an interesting game where I felt white was better most of the time until I initiated counterplay on the kingside. Interestingly enough, on further analysis, I would have been slightly better if I had resumed play on the queenside after creating play on the kingside. Play on both sides of the board! I remembered it when starting activity on the kingside but not afterwards! I often play this line of the Semi-Slav. I am getting ready for the c5 pawn break. At this point my opponent embarks on a rather weird knight maneuver, intending to trade knights. 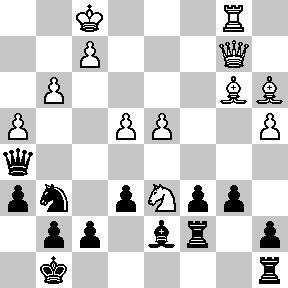 Initially I thought it was to put a knight on c5 and try and clamp down the black queenside. It turns out that wasn’t his intention at all. 12. Ng5 h6 13. Nge4 Qc7 14. Nxf6+ Nxf6 15. Ne4 e5?! The knight moves seemed like a waste of time to me, unless he wanted to place it on c5. I felt like I needed to challenge the centre, even as a slightly desperate measure. 17… Rfd8 18. Bd2 Rxd5 19. Bh7+ Kh8 20. Be4 Rd7 might have been another way to go, freeing up my position. Now my pieces get bogged down with his passed d-pawn, while constantly trying to determine if my queenside majority (and especially my pawn at c5) was a strength or a weakness. 18. e4 Rac8 19. Be3 Qd6 20. Be2 Rc7 21. Rac1 Be7 [21… c4 22. Qd2 Rfc8 23. Bg4 Rb8 24. b3 again looking to free up my position at the cost of my queenside pawn structure] 22. Qd2 g5!? For a few reasons. Firstly, I was seriously worried about 23. f4 exf4 24. Bxf4, and even if I don’t grab on f4, he could play fxe5 with the same motif. Moving the queen away from d6 could lead to dangerous forks with the pawn on d6, so g5 puts a stop to f4, at least temporarily. Secondly, I didn’t have any fears about moving the pawns in front of my king as I felt it would be quite hard for him to get to my king in this closed position. Thirdly, I grab some space on the kingside and I felt that in the current position all of my pieces could, at the right moment harmoniously swing over to the kingside and create good counterplay against his king. My next few moves are geared towards starting play on the kingside and achieving the third goal. Almost getting into a King’s Indian type of position. The bishop is a much better piece to block his passed pawn than my queen! 29. Bd3 f4 30. Bf2 g4?! would have put some serious pressure with the passed c-pawn and left me with the advantage. But, being in slight time pressure, I didn’t even look at the above line. I’d like to think I would have seen it and gone for it if I had time. I had a heart-stopping moment just before I played Qg5. I was about to play 33… h4, which would have blundered my bishop and led to my third straight loss. Time control made, with seconds left on my clock. With time trouble having been negotiated safely, my opponent made the draw offer, which I was glad to take as I didn’t see how I could force my way through in the final position. I played in the second of two games mentioned here on the 17th, again as black. White gave up a pawn in the opening in exchange for the center. I was always looking to return the pawn under favorable circumstances but my opponent didn’t want to cede the initiative to win the pawn back. We finally got into a very tricky bishop vs knight endgame which I managed to eke out. Here is the game. I also thought about playing b5 here but was worried about the weakness of c6 and a8. On hindsight though, I should have probably played that – to expose the c6 weakness, both the pawn on e4 and the knight on f3 would need to go to e5. With that not possible, I should have been safe! 10. a4 a5 11. Rd1 Nfd7 12. Ne5 Nxe5 13. dxe5 Qc7 14. Be3 Rd8 15. h4?! At the time I thought the idea with h4-h5-h6 was quite slow. This gives me the time to unravel myself somewhat and trade off some pieces. He explained later that he believed that with pawns on h6 (and probably f6), my king would have a hard time getting into the game and that he would hold the advantage. My opponent later said that he was expecting Qd3 here with an advantage for white and that Qd7 was almost losing. The two moves were also my main options – I went with Qd7 because I was worried I wouldn’t be able to hold on to the extra pawn after the swap of queens. It turns out that after 23…Qd3 24. Qxd3 cxd3 25. Kf2 a4 26. Bf1 Nc4 27. Bxd3 Nxb2 28. Bb1 Nd1+ 29. Kf3 a3, black’s passed a-pawn is very strong. 24. Bh3 exf5 [Qd3] 25. exf5 Qd5?! Again, Qd3 was the only way to maintain the advantage. 26…fxg6 [hxg6!] 27. e6 Qe5? Nc8, bringing it back into defense was better. 28. Qf3 Bf6 29. g4? This again tilts the balance in my favour. Fritz shows 29. Bf2 Nd5 30. Bf1 and the black queen-side pawns are collapsing and the bishops then attacking the king-side with even more venom. As it is, white’s move allows some simplifying tactics from black. 29…Qxe3+ 30. Qxe3 Bd4 31. Kf2 Kf8 32. Bg2 Ke7? [Bxe3+] 33. Bxb7? 33. Bxe4 Bxe3+ 34. Kxe3 c3 35. bxc3 a4 36. Bxg6 a3 37. Bb1 Kxe6 should lead to a draw with correct play. 34…c3 bxc3 was much stronger, creating a passed a-pawn. The last move to make the time control, with seconds left on the clock. Be4 was much better. Returning the favour with a lot more time left on my clock to make the time-control. Analysing after the game, we deemed this now to be a draw. Again, Fritz shows the line 35… a4 36. Ke3 c3 37. Be4 cxb2 38. Kd2 Nc4+ 39. Kc3 a3 40. Bb1 Na5, and black has a completely won game. 36. Bd5+ Kd6 37. Bxc4 Nxb2 38. Ba2? Completely losing the plot. Now I can just walk over and grab the pawn with no delays in tempo. 38…Kc6 40. Ke3 Kxb6 41. Kd2 Kb5? Now, giving up the win and allowing a forced draw. 41…c4, preventing the bishop from going to g8 was critical. Not taking advantage. 42. Bg8 Nc4+ 43. Kc3 Ne3 44. Bxh7 Nxg4 45. Bxg6 Nxh6 46. Be8+ Ka5 47. Bxa4 Kxa4 48. Kc4 is a dead draw. Now, the win is quite easy. After last week’s game, it is now seven straight games since I’ve lost. White, I think, was slightly better through most of the game. Near the end of the game, even when I went up a pawn, he had plenty of chances to force a draw. Instead he failed to find the right moves in time trouble. I normally have a very strong instinct to play quickly in my opponent’s time pressure, not giving him a chance to think on my time. This time, I took efforts not to make that mistake – instead, I tried to choose continuations which would force him to calculate multiple variations at critical junctions. End result? I won on time. The game, as always, can be replayed here. I have now acquired a copy of Fritz 11 and this position has occurred twice in its database. After 10.O-O O-O (which was played in the above games), it transposes into more common variations. I was fully expecting Bb4 at this point. I didn’t like Nc5 as after I capture the white knight, both recaptures help Black’s position. If Qxc5, Bb6 and I can start thinking of moves like c5, when I challenge white’s control of the center and my pieces start coming to life. If dxc5, as in the game, white loses his pressure on the c-file, he has no direct threats and I can start repositioning my pieces to more active squares. The computer prefers Qd5 or a5. In fact I considered both of these moves but couldn’t come up with a clear plan. With e5, my idea was this. First of all, if white made some random move, I was hoping to play Re8, followed by e4, and I am clearly better. On the other hand, if white played e4 himself, he closes the light-squared diagonal, which is where he exerts the most pressure. By the same token, my dark-squared bishop is now useless as well, but with a closed position, I would have enough time to relocate my useless c8 rook and b7 bishop to more useful squares. My opponent spent a very long time before playing Bc1. I was actually quite surprised; I felt he would play Bh4. Getting out of potential traps like f5, exf5, followed by e4, forking the knight and bishop. Somewhere in my calculations, I had assumed that I would be up a queenside pawn at the end of these tactics. The realization hit home only after White’s 26th move. By this time, my opponent was in serious time pressure. Being in a worse position, I wanted to make sure I didn’t make too many moves where his response was forced. With this, we both made the time-control – my opponent with just a few seconds left. With the time-control for the game only adding another 15 minutes for the rest of the game, he wasn’t quite out of the woods yet! As so often happens, he blunders right after making the time-control. Both Ra7 and Ra8 probably lead to forced draws. 36…Nf6 37. Qd1 Qxh3+ 38. Kg1 Rf8? I gave a good, long think about 38…e4, giving up the exchange but probably winning. But I was unable to calculate all the variations and decided to play it safe. The position is probably quite drawish at this point, but my opponent, having burnt most of his remaining time on his 37th move finally ran out of time and I won my second game of the year on a time forfeit! Last week was the last match of the season for the Bedford Chess League. My team needed a match victory to ensure 5th place in the standings, a step up from last place (8th) last year. I was playing black on board 3, matched up against a much lower rated player. As always, the game can be replayed here. I have recently started playing the Semi-Slav as black in online chess but this is my first attempt over the board. In this gambit variation, play is normally extremely sharp with 7.e4 g5 8.Bg3 b5 and white has a strong initiative for the pawn. With my opponent instead playing a4, trying to prevent b5, I tried to take advantage of the hole on b4. Until this point, my play might not have been very accurate but it has been enough to garner a near-winning advantage. After going up in material fairly early on, I was pushed onto the defensive as I was behind in development while white was able to exert a fair amount of pressure. After needing to be careful about my queen getting trapped for a few moves, I felt fairly confident that the queen’s jump to the kingside, coupled with the opening up of the position with c5 would settle the game quite quickly. A huge blunder. Now my queen is trapped. 27…Qf3 would have still maintained my advantage. Against a stronger opponent I would have probably resigned after his 28th move. Instead, I decided to play on with a rook and two pawns against a queen and give my opponent a chance to redeem the favour. 30.Rc1 Rd8 31.e5 Bc6 32.Qd2 Bd5 33.h5 Nf8 34.g4 f6 35.f4 Bf3 36.g5 hxg5 37.fxg5 fxe5 38.Nb5 Rf7 39.Ke1 Bxh5 40.Qh2 Bg6 41.Ke2? Question marks could have been attached to most of the previous white moves, as at some point or the other, he should have played dxc5, giving me isolated, doubled pawns on the e-file and another weak, isolated pawn on the c file. Now he instead loses another pawn for no gain whatsoever. It is also quite likely that question marks can be attached to several of my moves as they weren’t the best moves. But I was trying not to make forcing moves; instead providing my opponent with several options and more ways to go wrong. Sensing the strength of my connected passed pawns, my opponent offered me a draw. Here was my final blunder of the game. With the other games of the match already completed, I should have looked to my captain to find the match score (It was 2.5-1.5 and a draw in this game would have clinched us the match). The right move on my part would have been to accept the draw at this point. However, feeling that I was better already, I declined the draw and kept playing.